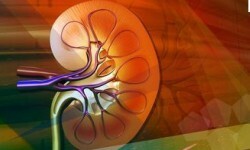 Nephropathy means kidney disease or damage. Diabetic nephropathy is damage to your kidneys caused by diabetes. In severe cases it can lead to kidney failure. Diabetes insipidus (DI) is defined as the passage of large volumes of dilute urine. It has the following 2 major forms: Central (neurogenic, pituitary, or neurohypophyseal) DI characterized by decreased secretion of antidiuretic hormone (ADH). Nephrogenic DI, characterized by decreased ability to concentrate urine because of resistance to ADH action in the kidney. Polyuria and nocturia are common symptoms in diabetes. People with diabetes are at increased risk of renal atherosclerosis, urinary tract infections, papillary necrosis and glomerular lesions - eg, from basement membrane thickening and glomerulosclerosis. Diabetic nephropathy may be diffuse or nodular (Kimmelstiel-Wilson lesion). The early stages cause an elevated glomerular filtration rate with enlarged kidneys but the principal feature of diabetic nephropathy is proteinuria. This develops insidiously, starting as intermittent microalbuminuria before progressing to constant proteinuria and occasionally nephrotic syndrome.